Author Kelvin D. Filer has always been an inquisitive soul, even as a little tyke. At a young age, he had already exhibited leadership abilities, and those abilities rest in him till this day. 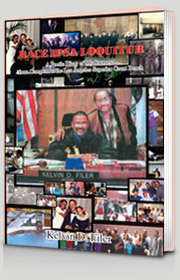 Follow his eventful life in Race Ipsa Loquitur: A Poetic Diary of My Journey from Compton to the Los Angeles Superior Court Bench. This poetic diary begins a few years before the author left for college at UC Santa Cruz, Santa Cruz, California. Writing was a pleasant hobby at that time in his life, which later became more focused and a form of therapy and self-encouragement. As you browse through Race Ipsa Loquitur, you will know the events that happened during his adolescence and college matriculation, his thoughts during law school and the pain he felt during the difficult times in his life. You will cheer him on when he reaches the pinnacle of his wonderful journey—when he is appointed as a superior court judge. Kelvin D. Filer's collection borrows its name from a Latin legal phrase, res ipsa loquitur, meaning: "the thing speaks for itself." It's noteworthy that he describes the book (in the subtitle) as a poetic diary, rather than poetry, a current trend that can be confusing: they're not supposed to be actual poems, but poetic? Here, the entries are more interesting as memoir rather than poetry. Filer begins in high school and moves chronologically from there to his life as a judge in Los Angeles. He includes photographs and an introduction by his brother, Duane. He is an intelligent, conscientious and compelling writer, commenting on social justice, values, culture, ethics, character, and responsibility. He's not bashful about discussing painful issues such as divorce, the loss of his grandmother, his beloved dog. Many of the poems amount to homilies; others are recollections; some are tributes to those special in his life. The author has so much warmth and authenticity that readers will find ways to appreciate his collection.